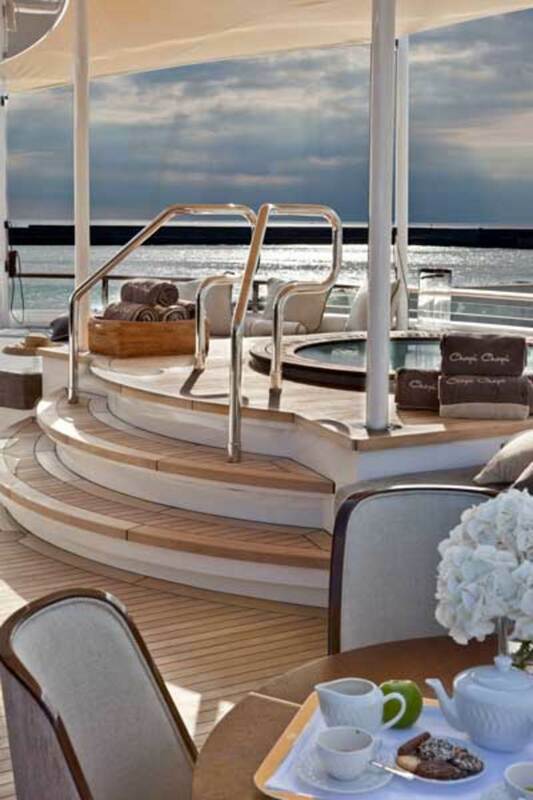 CRN’s 263-foot flagship Chopi Chopi offers convincing evidence of the upward mobility of the superyacht market. 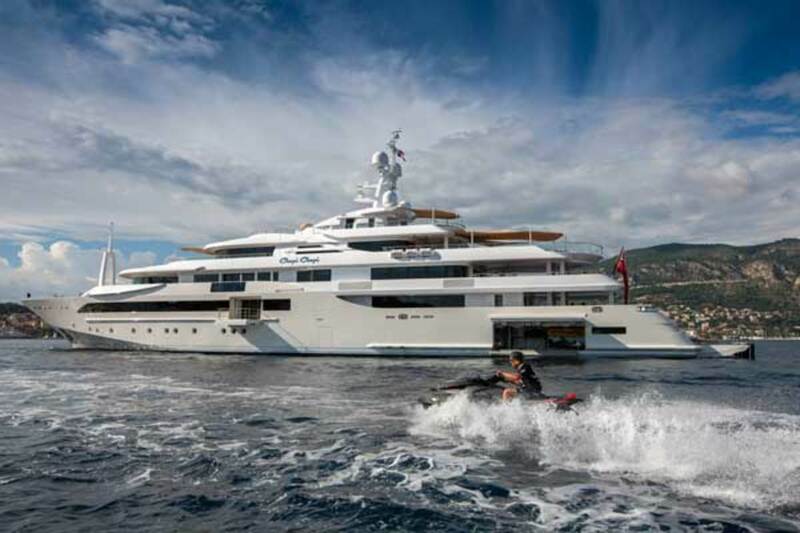 There was no mistaking Chopi Chopi’s 263 feet (80 meters) of gleaming eggshell and snow-white paintwork moored at the end of Quai de l’Hirondelle at the Monaco Yacht Show last fall. 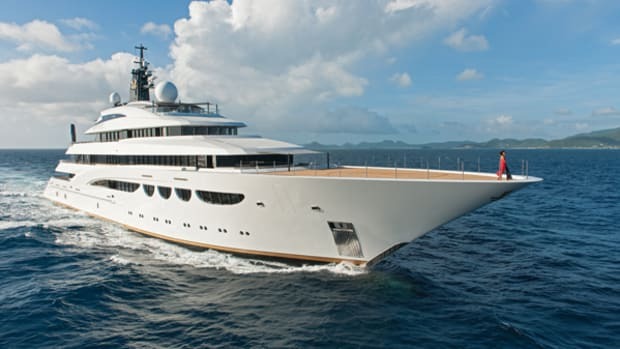 Her five deck levels, excluding a sub-lower deck, towered over the other yachts nearby. 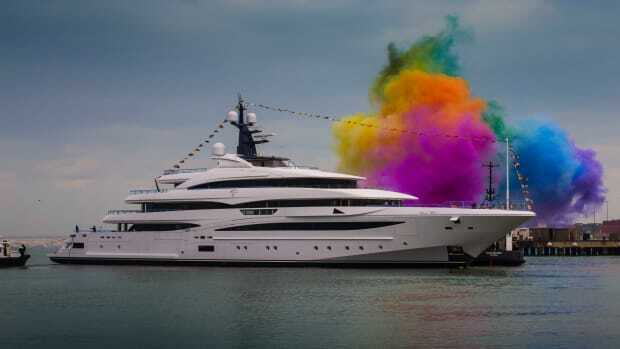 As CRN’s largest and most spectacular launch to date, she appears to support the trend that owners are investing in ever bigger yachts, and “more is more” is once again the name of the game. She is over 26 feet longer than Azteca (ex-Clarena II), the yard’s previous flagship launched in 2009, but at nearly 2,400 gross tons, her volume is exponentially greater and provides 3,280 square feet of indoor floor space and 2,625 square feet of outdoor area. 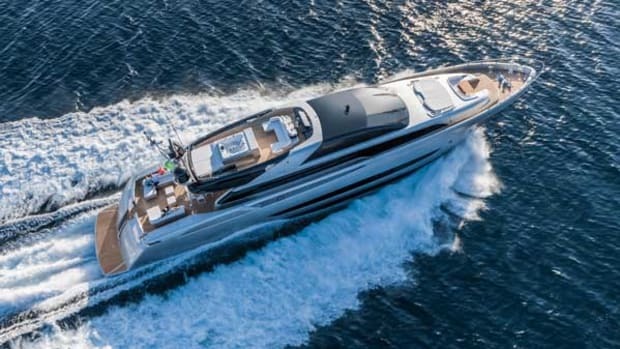 Tacoli’s claim is supported by Richard Hodgson, co-director of Mega Yacht Solutions, who spent three years at the shipyard in Ancona as the owner’s representative on the project and went on to captain Chopi Chopi for the initial shakedown period. 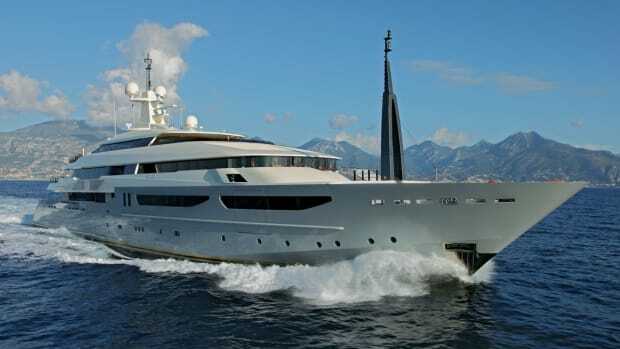 Having previously represented the owners of 177-foot (54-meter) Maraya and 197-foot (60-meter) Mimtee, also built by CRN, he has firsthand knowledge of working with the yard, which, as part of the Ferretti Group, is majority-owned by the Shandong Heavy Industry Group in China. He points out that the step up in size brought some challenges that the builder helped to address. Based on his operational experience, Hodgson wanted to max out on the tenders, which meant modifying the garages. The limo in question is a 31-foot (9.5-meter) Dariel dLimo that has just inches to spare on its chocks inside the starboard garage. 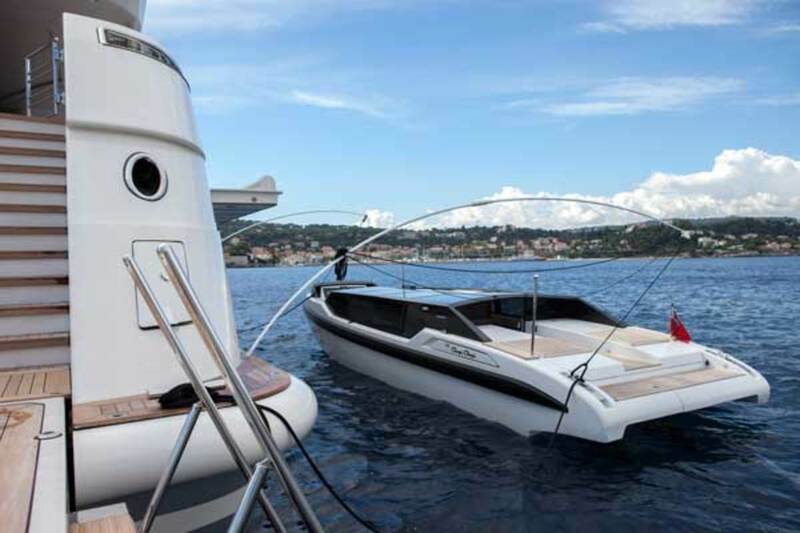 The yacht also carries a Riva Iseo, originally intended as the limousine tender, but either tender can be stowed in the same garage while the other is towed behind. A wakeboarding boat in the forepeak meant upgrading the davit to 5,500 pounds, while a 24-foot (7.5-meter) jet RIB in the portside garage is ideal for use in shallow waters. 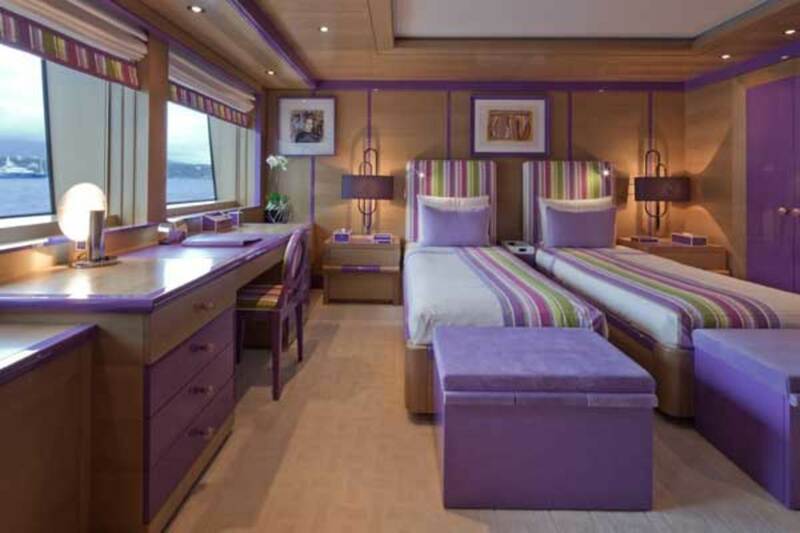 A custom-designed inflatable dock can be attached to the stern platform to make accessing smaller water toys, such as kayaks or paddleboards, less precarious. 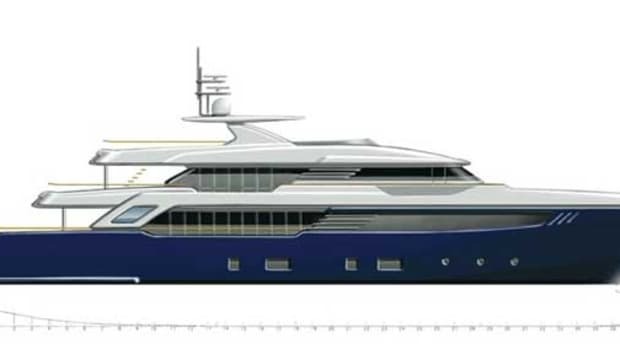 Hodgson joined the project when the metalwork was almost complete, but he collaborated closely with CRN’s technical office to fine-tune the specifications based on his and the owner’s recommendations. 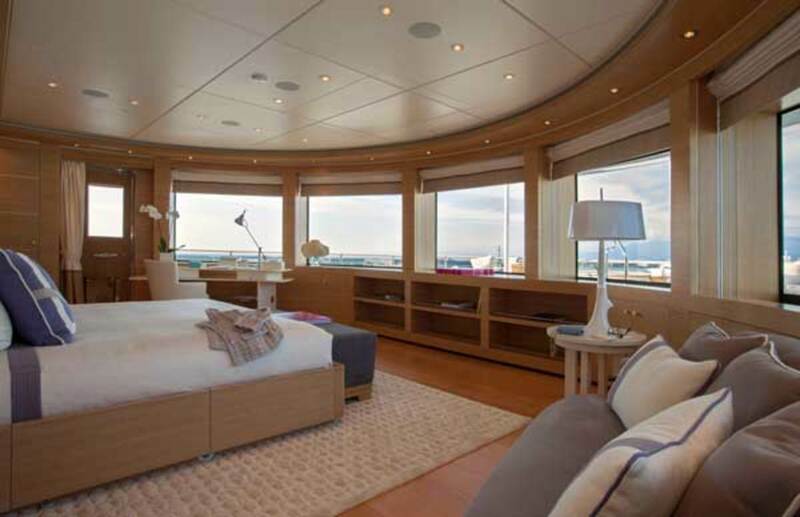 One area of particular attention was the enormous circular bridge, which has a 30-foot radius and 270-degree view of the sea. 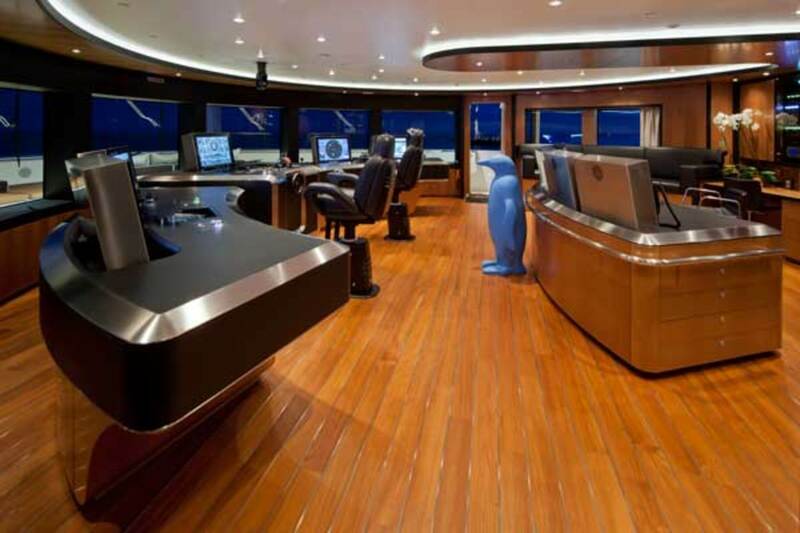 Together with navigation electronics consultants Team Italia, he developed a walkaround wheelhouse console for easy maintenance access with an I-Bridge integrated system and Kelvin Hughes hardware modeled on the ocean liner Queen Mary II. An I-Chart table, a new product from Team Italia resembling a giant iPad with a 42-inch touch screen, was also installed at the back of the bridge. 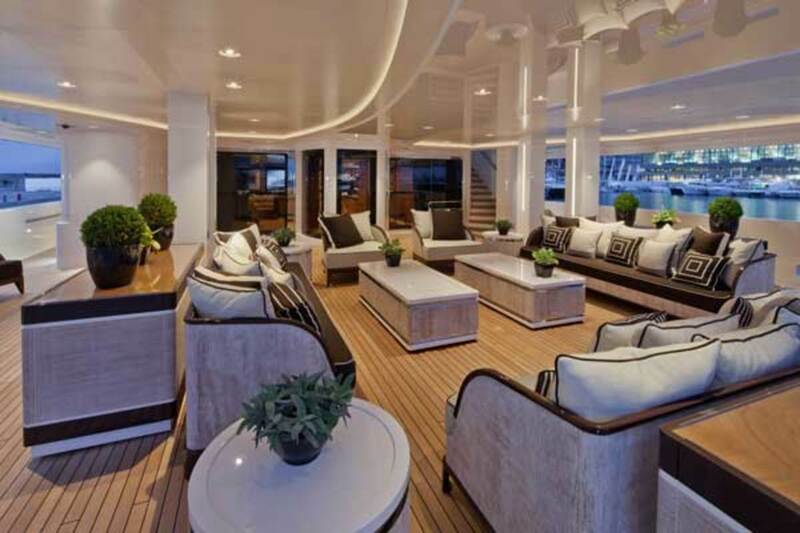 Despite impressive ceiling heights in excess of seven feet, the exterior styling by Zuccon International Project presents a graceful and well-proportioned profile on the water. 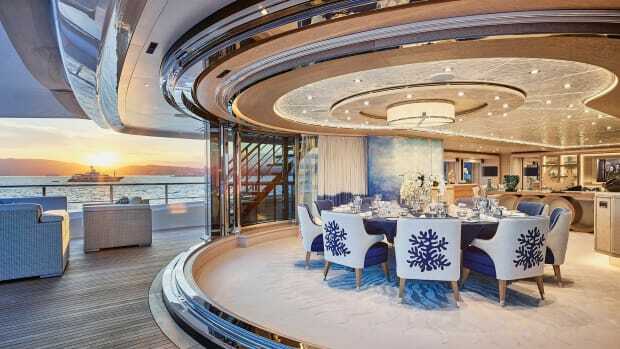 The Rome-based studio, a longtime design partner of CRN, also helped define the interior layout around the owner’s extended family, whereby at least 15 guests are usually on board at any one time. 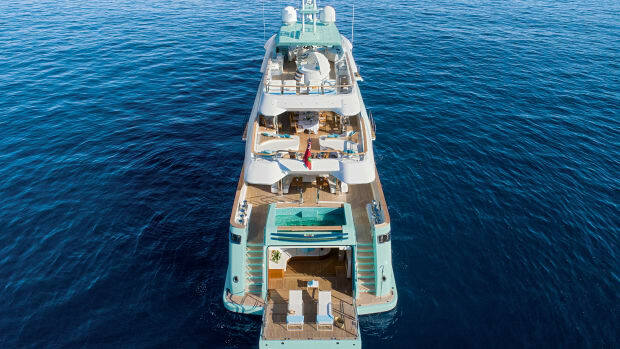 “The owner was not primarily concerned about his own suite, but more about the cabins for his children, nephews and nieces, which is not usually the case by any means,” says Bernardo Zuccon, who heads the studio’s superyacht division. The interior designer was then tasked with transforming the same family-oriented values into a casual yet sophisticated interior. 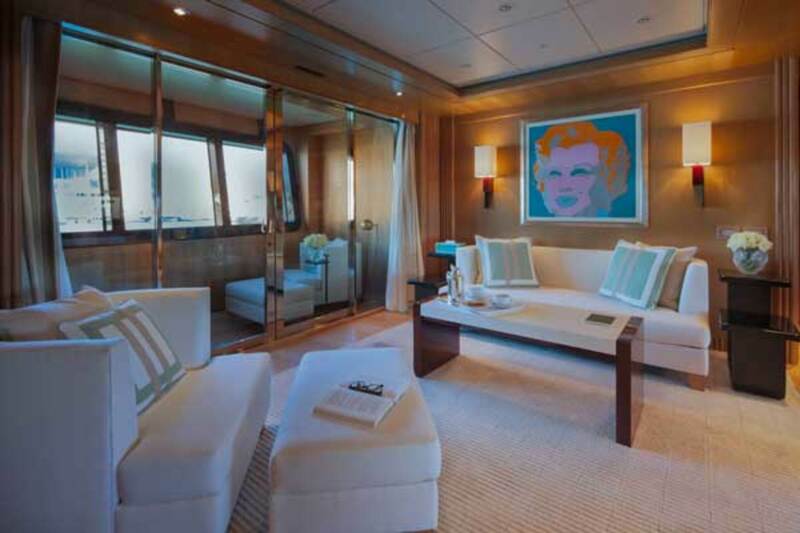 On this front, she could draw on her experience of working with the owner on the interior of his previous yacht, 170-foot (52-meter) Lady Nag Nag built by Amels. 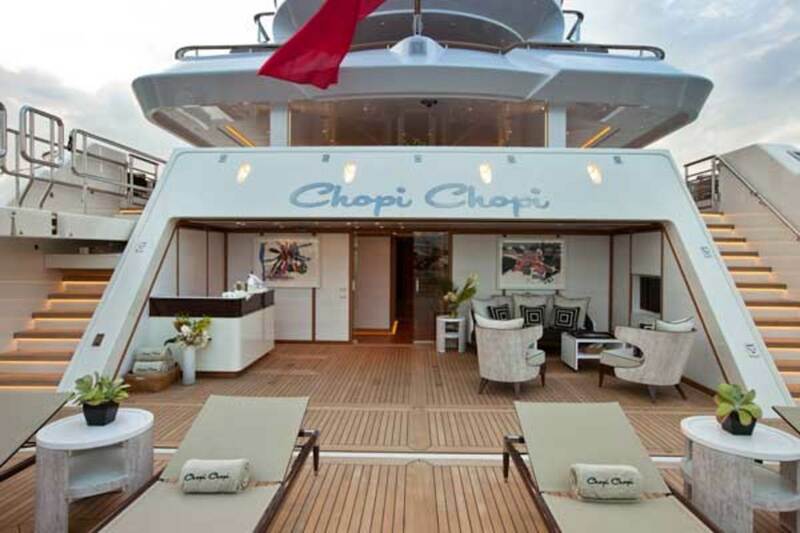 The décor aboard Chopi Chopi is based on a variety of veneers, from brushed teak and maple to ash and Oregon pine—all light-toned timbers for a fresh, airy and unpretentious ambience. 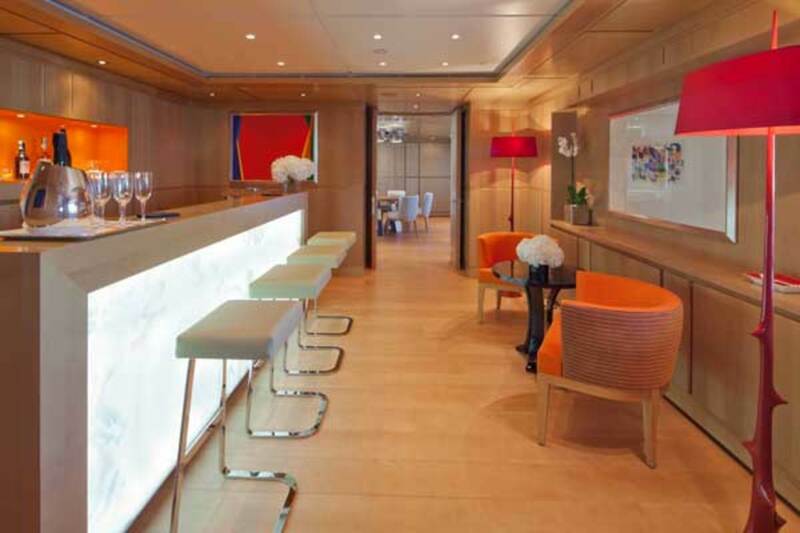 Unusually, the main salon features a wide, central staircase that leads down to the aft beach club, where a novel detail is the black and white saddle leather stitching bordering the teak wall panels. 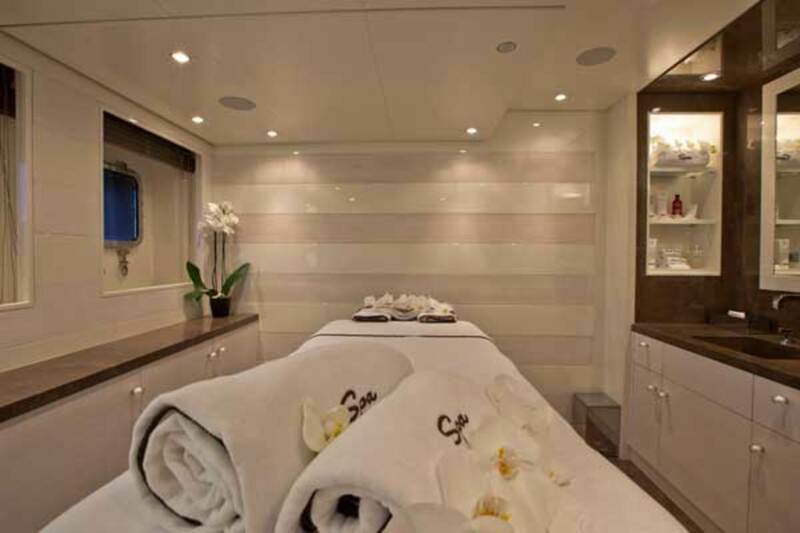 With loose deck furniture by Glyn Peter Machin, Sessa says, this was the most popular area of the yacht, especially the massage room, during the first summer season. 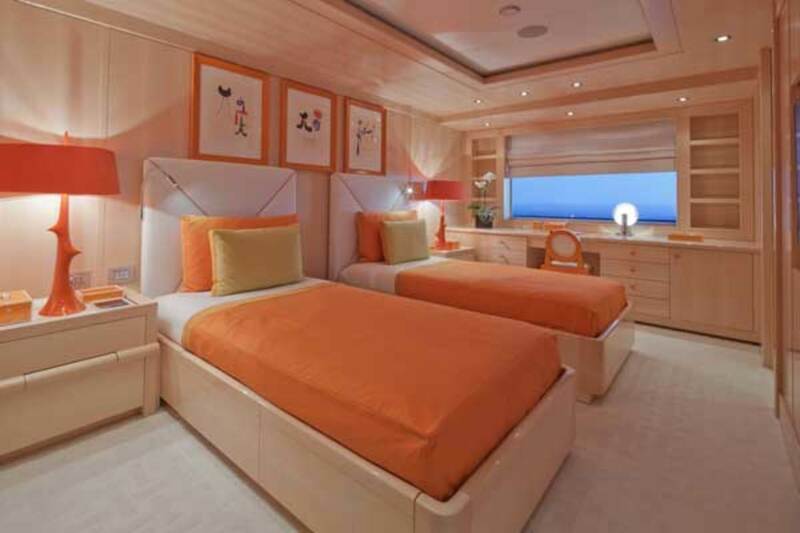 Works by renowned artists such as Fernando Botero, Andy Warhol, Pablo Picasso and Joan Miró punctuate the walls with primary colors, and bright palettes of orange, azure and purple personalize the children’s cabins on the main deck. 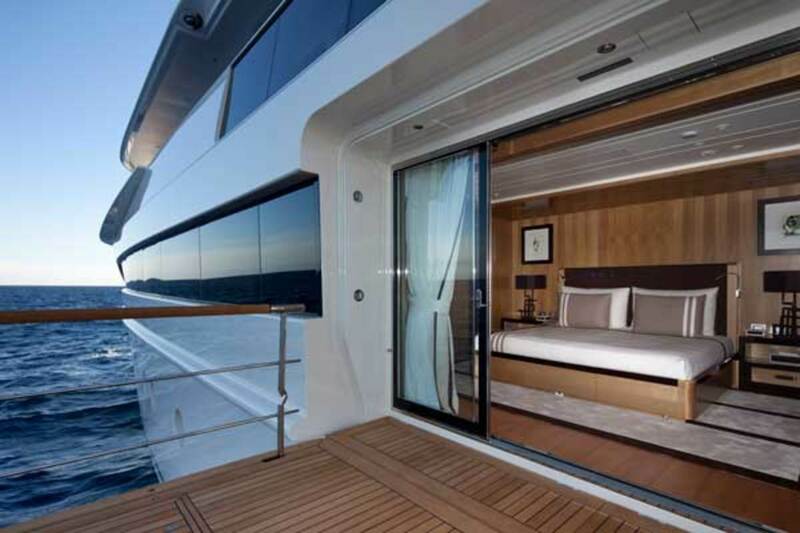 One cabin and a business room feature fold-down balconies, whereas the forward, full-beam VIP cabin has a fixed balcony that can be used while underway. 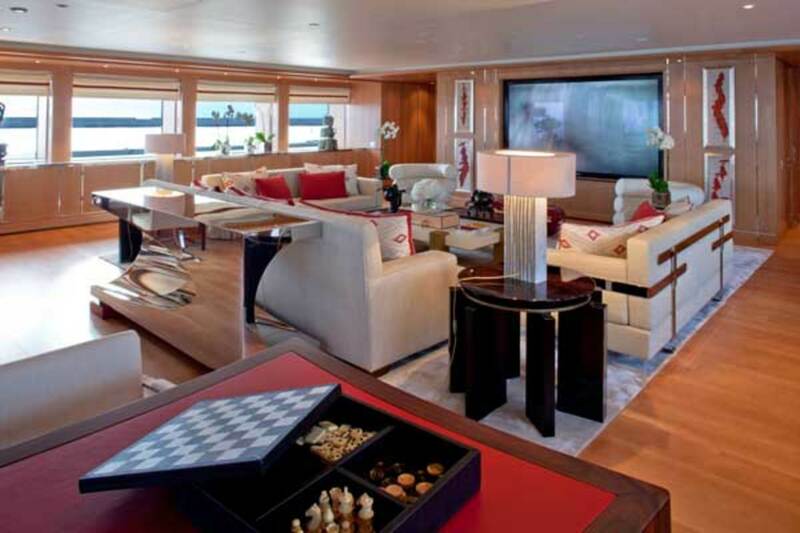 The owner’s suite occupies the entire deck above the bridge. 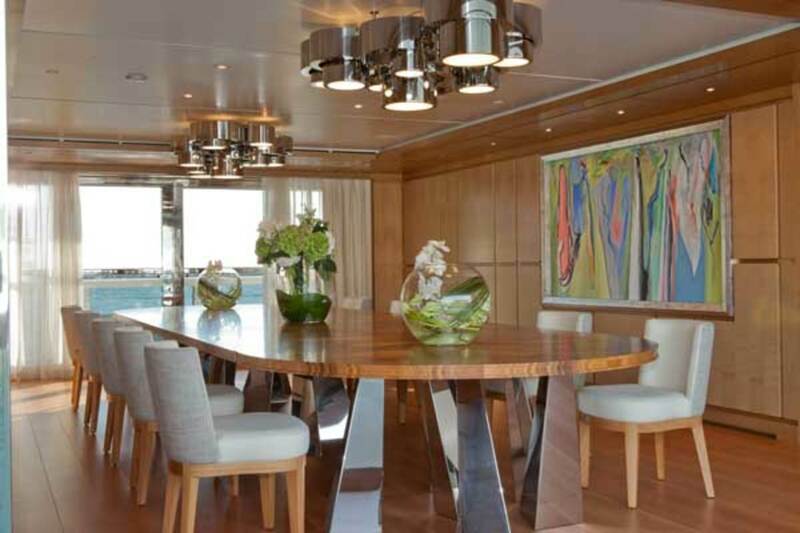 Wall sconces, low tables (glass bulwarks allow unimpeded views of the sea) and the enormous dining table with legs of solid bronze that can seat 22 guests are by French artist-designer Hervé Van Der Straeten. In the sky lounge is a classic chromium-plated Bidendum chair by Eileen Gray and an exquisite mahogany games table by the Portuguese designer Luísa Peixoto. Hindsight is a wonderful thing, and had he joined the project earlier, Hodgson would likely have recommended diesel-electric propulsion for Chopi Chopi, which has the technical space for the multiple generators and switchboards. 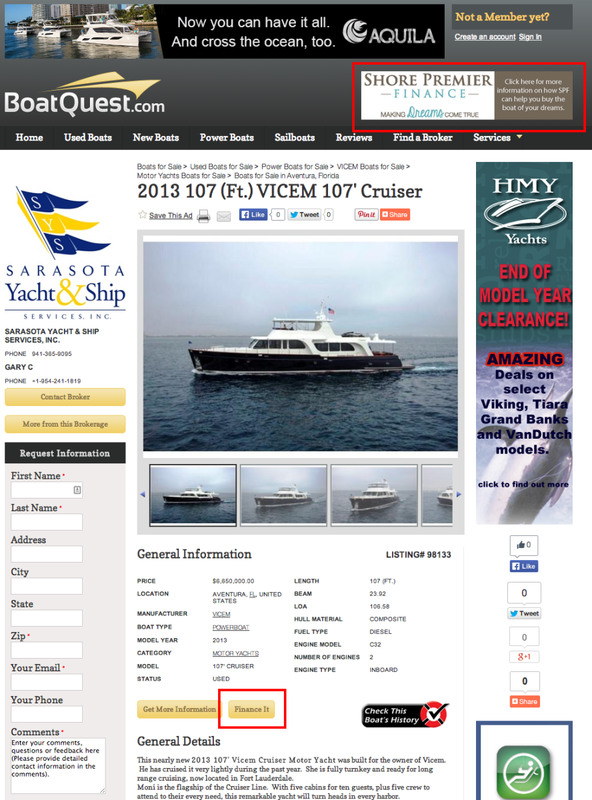 For the time being, however, it seems the yacht will remain the flagship of the fleet into the near future. 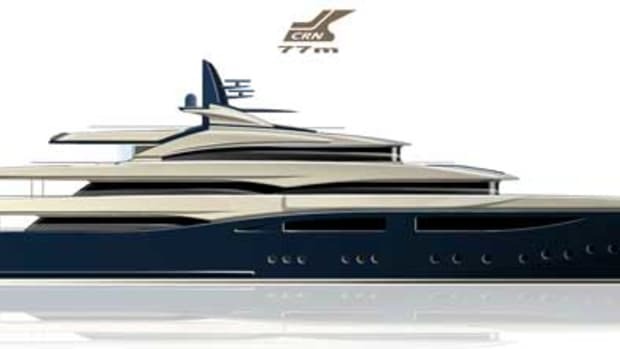 Of six new CRN builds under construction in Livorno, the new 122-foot Riva Mythos and a 61-meter (200-footer) designed by Francesco Paszokwski have been launched, and a 72-meter (236-footer) by Omega Architects will follow in May. 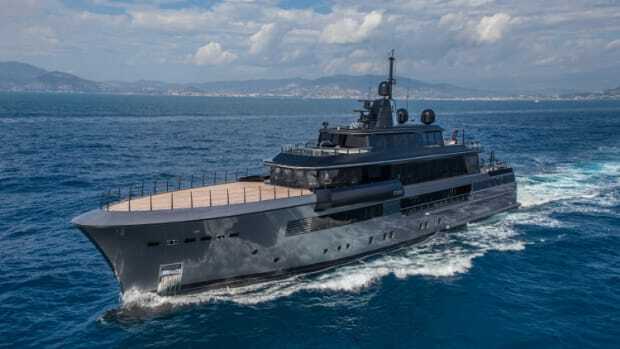 In addition to letters of intent (LOI) for two SuperConero 44-meter (144-foot) yachts and a 68-meter (223-foot) motoryacht for a Chinese client—the largest ever sold in China—another LOI has been signed for a 77-meter (253-footer) destined for the Middle Eastern market.